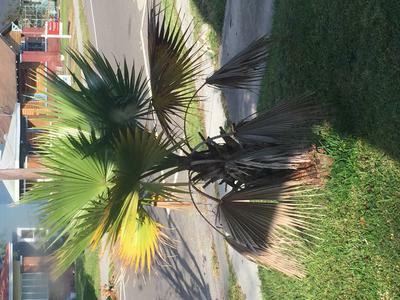 We have a 'baby' palm tree in our front yard, the bottom leaves are always brown, drooped, and dead. We have only lived here about 7 months, and we do not own the home so we don't know much about the tree. About 6 months ago, we cut off the bottom dead leaves, but it keeps happening, so we left it alone since. There are always new green leaves at the top/center. 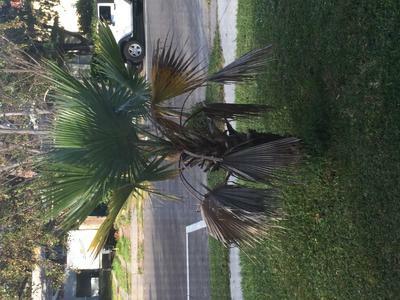 Is there anything we should do to take care of the tree, or should a palm tree planted outdoors like this be taken care of by mother nature? It doesn't seem like it's grown any taller this year either, but palm trees maybe grow slowly, I'm not sure. Does this tree seem like it's dying or is this normal? We live in Jacksonville Florida. Comments for Is my palm tree dying? I do know that these suckers are tough! They can withstand hurricanes and live on salty beaches, so they must be. The dying leaves are a natural way of shedding the older growth, so if possible, let nature take care of it. If they're a fire hazard or smothering other plants, by all means, trim them off. In time, you'll get a handle on the way this plant grows and it's habits. It looks healthy to me, so keep doing what you're doing - less is more with palm trees. They thrive best with benign neglect.